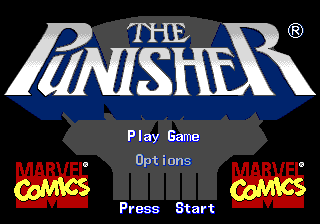 The Punisher is a beat-'em-up game for the Sega Mega Drive, based on the comic book series with the same name. It is a port of the 1993 arcade game of the same title by Capcom, and stars The Punisher (player 1) and Nick Fury (player 2) attempting to defeat The Kingpin (also the antagonist of Spider-Man vs. The Kingpin). The Punisher was the fourth game published by Capcom on the Mega Drive (following Street Fighter II': Special Champion Edition, Super Street Fighter II and Mega Man: The Wily Wars) after a history of licensing porting rights to Sega themselves, although the actual development of this game was outsourced to Sculptured Software. Several heavy cuts had to be made to fit the game onto the (still generous) 16 Megabit cartridge, with most sprites and background redrawn to fit a smaller scale. This was notably the only home conversion of The Punisher arcade game ever produced as despite Capcom's prominent support for Nintendo platforms at the time, no Super NES version was made. Main article: The Punisher/Magazine articles.